I planned to get to Missions Theory. But the topic got me thinking about terminology and classifications. “Weakness Missions” is not a satisfying term. After all, there are a lot of ways to be weak… many of them are unproductive. I considered “Subversion Missions.” Unfortunately, there are a lot of definitions for subversion, some of which are completely inappropriate. Subversion may mean undermining the beliefs and power structures in a society from a position of weakness. Sometimes, it can be used more broadly of overthrowing, regardless of method. It also can involve overturning moral constraints regardless of whether the moral structure is good or bad. So I started looking at non-violence theory. I have never really studied that topic much. I was in the military so I know more about power projection, and control. My problem is that nonviolence theorists often start from a belief that utilizing nonviolent means is more likely to lead to success than utilizing violent means. While nonviolence has had its share of successes, its failures have been equally legendary. Many changes, even positive changes, have occurred through violence. I found, however, a lot of interesting thoughts in nonviolence theory as it pertains to missions. But there is the question of power as well. Power, after all, is not necessarily related to violence or non-violence. On the violent side, things are pretty clear… some types of violence are used from a position of power and some types are used from a position of weakness. We sometimes forget that terrorism is used because the individuals conducting terrorism are weak. Of course, their use of violence is meant to pressure change while masking the underlying weakness. Okay, but what about the other two? Well, looking at the various types of non-violent response, some seem to have merit and some don’t (at least as it pertains to missions). Two that fit well into the graph above are types described by Mahatma Gandhi. 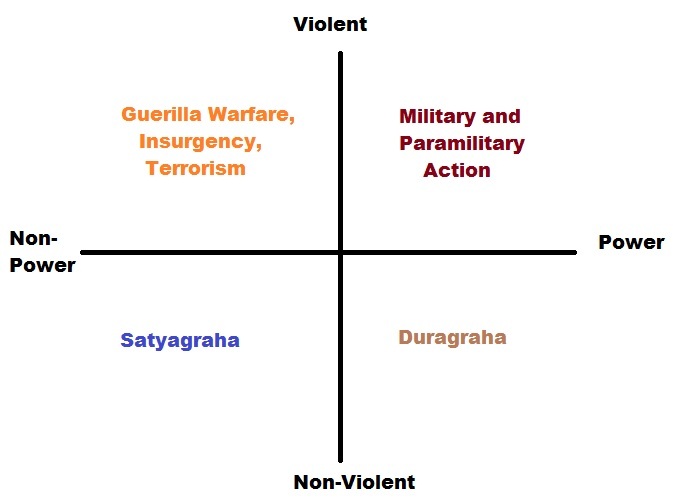 Satygraha (I am pulling from Wikipedia here under Nonviolence) literally translates as “insistently holding to the truth.” Gandhi described it as a position of the strong, but not necessarily utilizing “power tactics.” As such it is a matter of choice rather than necessity. The focus is on utilizing truth and love, working through patience and willingness to suffer. Duragraha literally translates as “holding on by force.” It is also nonviolent, but may use forms of non-violent harassment, and may not be focused on the truth. A lot of non-violent protest (PETA, Greenpeace, anti-abortion movement) utilizes this one. As such, Satyagraha seems quite similar to what (in my opinion) is best in Christian missions. I would like to suggest that Jesus worked from a position of non-power and non-violence. As noted above, such a position does not mean lacking in strength or potential to act on power, but a conscious choice to not utilize power… focusing on love and truth with a willingness to suffer to the end to cause change. I could describe good Christian Missions as Christian Satyagraha Missions. Some might be offended by this because it may sound a bit Indian or Hindu. But that is a Western prejudice. The term Missions has its roots in pagan Roman terminology. It is just that people in the West have gotten use to Latin and Greek and German and English, but haven’t gotten used to Asian terms. Frankly, I am unconvinced that nonviolence is more effective than violence in creating change. I am unconvinced that operation from a position of non-power is more effective than operating from a position of power. However, I believe as Christians we are called to operate from a position of meekness (having power but acting with loving constraint). And in missions, this position has been extremely successful in causing change. Personally, I think that this fact comes more from the work of the Holy Spirit than it does from the inherent strength of such a strategy. …. but I could be wrong. Next post, I will look at some Christian mission work from this view.